I had some leftover cranberry sauce, so I made a half-recipe of muffins ... But it turned out to make eight muffins, so that's really a three-quarters recipe. You can make these delicious muffins for breakfast, or if you want some seasonal dessert muffins, throw in some chocolate chips for extra yumminess! 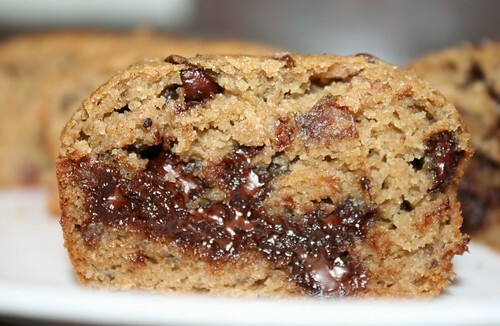 This is what they look like with the optional chocolate chips. 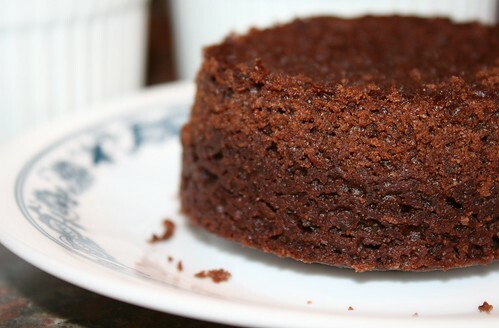 Distribute batter into a lightly oiled muffin pan. This should make around eight muffins (maybe seven if you're omitting the chocolate chips). Bake at 350 degrees Fahrenheit for 23 minutes. 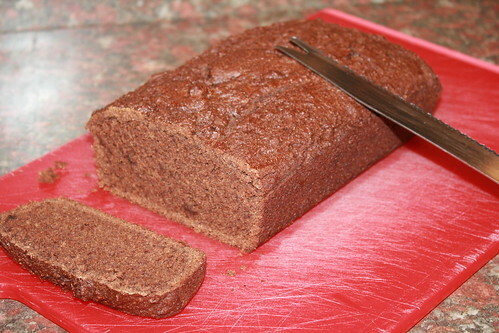 Allow to cool for at least a few minutes before removing from pan. 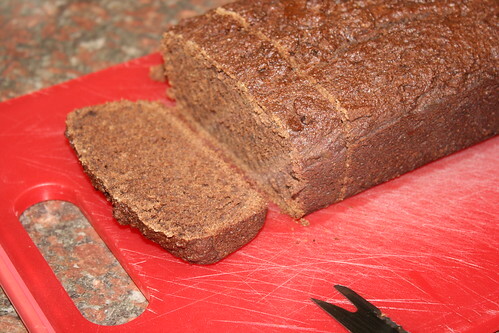 This is what they look like without chocolate chips. Verdict: I love these. The orange flavor gives it a great boost, but if I had had an orange around I might have zested it and thrown that in and cut the orange flavor by half. It actually could have stood to be more cranberry-heavy, but I like these so much anyway that I won't complain. and microwave until chocolate and Earth Balance are melted. (This took about 90 seconds at 60% power on my ancient microwave.) 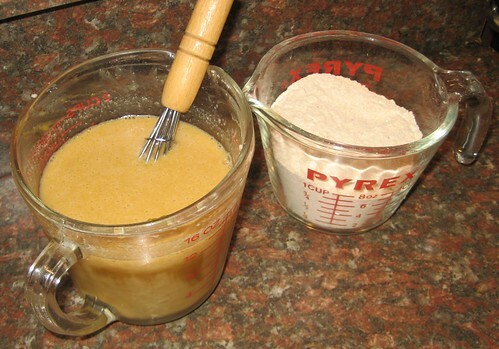 Stir with a whisk or a fork until mixture is smooth. 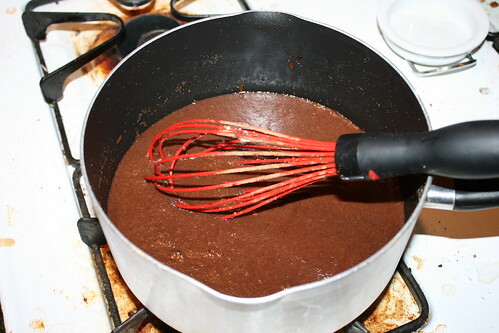 Add flour mixture to the chocolate mixture and stir until combined. 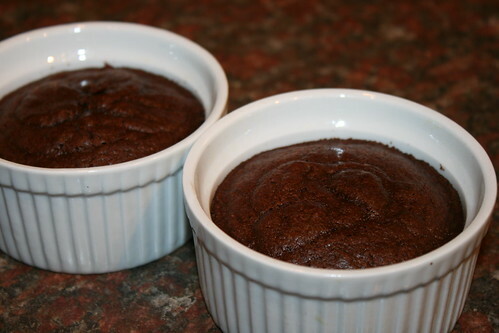 Divide batter evenly into two 8-ounce (1 cup) lightly oiled ramekins. Bake at 325 degrees Fahrenheit for 29 minutes. Allow to cool. 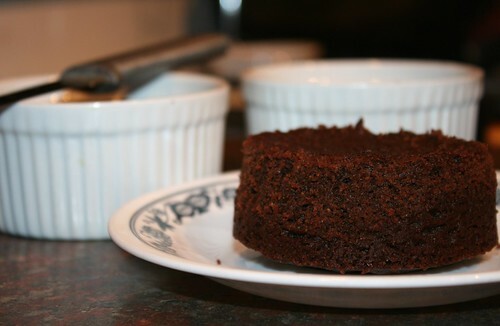 Run a knife around the edges and invert ramekins to remove brownies (or eat them directly from the ramekins). Have a bit of pumpkin to use up? 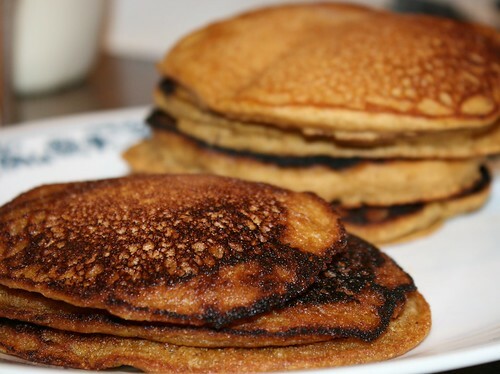 How about a stack of pumpkiny okara pancakes? Add the dry ingredients to the wet ingredients and whisk until well incorporated. Grease a pan with Earth Balance or spray with vegetable spray, if needed (maybe you have a trusty non-stick pan and don't do that stuff). Heat over medium-high heat. To see if the pan or griddle is hot enough, flick some water droplets on it. If it sizzles, the pan or griddle is ready to go. 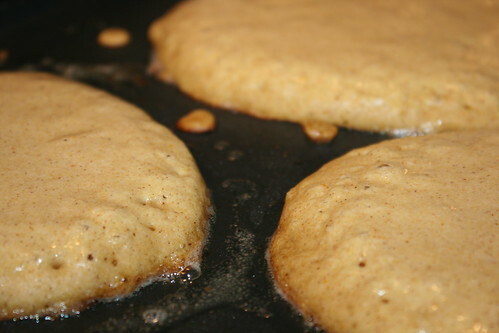 Pour about 1/4 cup of batter on the surface for each pancake. The batter will start to bubble. When the bubbling starts to subside, that's about when the pancake should be flipped. 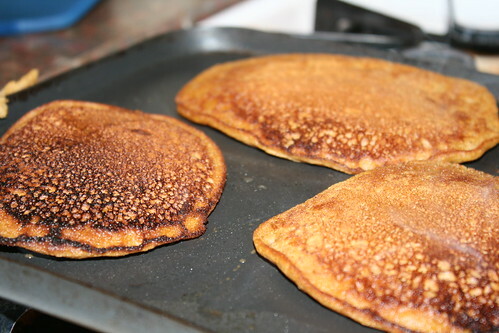 After flipping your pancake, you should cook it on the second side for about half as long as you cooked the first side. Continue to cook your pancakes in this manner until you are out of batter! 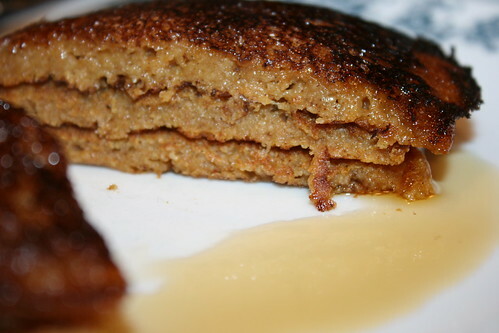 I stacked these up and ate them with Earth Balance and maple syrup. Verdict: I liked these ... a lot. However, the seasoning was a wee bit on the "bland" side, so if you like a lot of spices, you might want to use heaping teaspoons and whatnot. Heck, I might even double some of the spices next time. Not sick of pumpkin stuff yet? This recipe is tweaked from an earlier pumpkin pie recipe published here. As promised, this version is a bit sweeter. 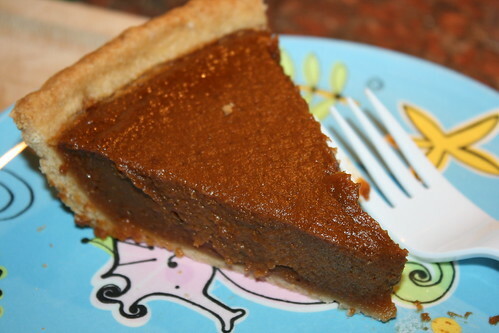 Verdict: This is everything I need a pumpkin pie to be. If you need it to be sweeter still, you can look into vegan whipped cream or this "Rad Whip" I hear tell about. So it's been awhile. That's because I've been trying (and succeeding!) to cut down on my sugar intake. And, unfortunately, most of my okara creations have been baked goods. However, with an investment in some 8-ounce ramekins, I have looked into the possibility of creating single-serving desserts, so that I can have something nice but not keep eating it day after day. 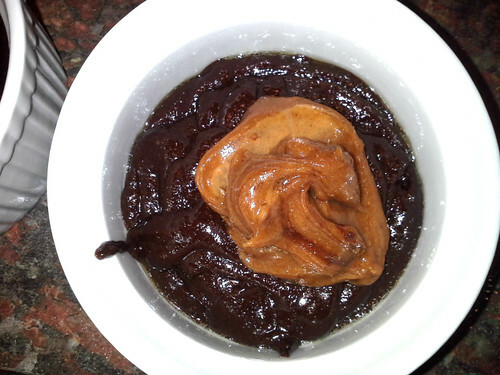 I actually initially sought to come up with a microwave brownie, but all my attempts were gooey and awful. So instead I've been baking these in a toaster oven. Microwave recipes are so imprecise, anyway; the toaster oven is the way to go. until mixture is smooth. Set aside. and whisk together until smooth. When mixture is thoroughly incorporated, divide batter evenly into two 8-ounce (1 cup) lightly oiled ramekins. 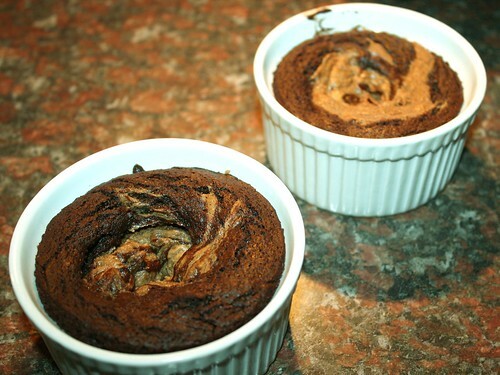 Then drop a dollop of the peanut butter mixture on top of the chocolate batter. 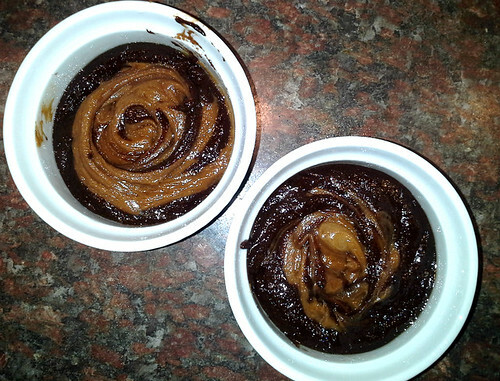 Using a knife, cut through the peanut butter and chocolate batter to create a "swirl" effect. Bake at 325 degrees Fahrenheit for 27 minutes. Allow to cool. I wasn't able to get these out in one piece (though I came close), so this might be something you want to eat directly from the ramekin.